Status OB-1 review | What Hi-Fi? Status Audio markets itself a little like the OnePlus of the headphone world. It sells its headphones directly, avoiding the pound pile-on caused when dealers and middle-men start getting involved. Its OB-1s are studio-style open-backed headphones that look, at a glance, like something Sennheiser might charge £150 or more for. Comfort and fit are spot-on. However, while there’s reasonable scale to the sound, it’s unfocused and lacking in dynamics. They aren’t a reason to give up using your Sennheiser Momentum 2.0s just yet. The Status OB-1s are full-size, over-ear headphones and siblings of the closed-back Status CB-1s. While designs like these are implicitly for home use, more people may be happy wearing their look out on the street than the CB-1s because they don’t stick quite as much. They look, well, normal. They are mostly black, apart from the steel inside the headband and the ring of aluminium around each cup (which, surprisingly, is real metal). The grille that lets the drivers touch fresh air, but not your fingers, is coated metal too. Aside from appearing a little generic, in part thanks to the lack of branding, in places the Status OB-1s look like they could easily cost well over £100. The sign this is a budget-conscious design is the headband padding. As well as being a little too shiny, the fake leather on the foam pad hasn’t been perfectly tailored to fit the headband’s curve, leaving slightly awkward-looking crinkles. When you’re paying £70 for something that is otherwise well-made, though, we should forgive it. 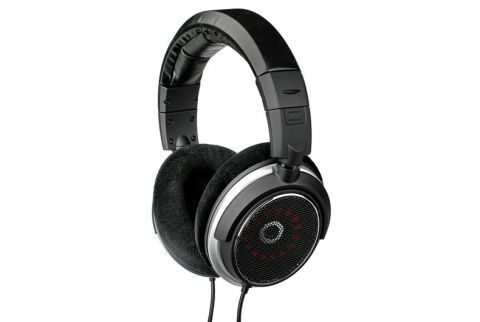 The Status OB-1s are also extremely comfortable, feeling similar to the Sennheiser HD595s. The ear-pads are covered in felt-like fabric rather than fake leather, which is softer and less likely to warm your ears. Padding up on the headband is thick and soft, leading to an authentically sumptuous feel. You may not be able to wear them in the office without annoying everyone around you – these open-backed headphones leak sound freely – but you could certainly sit through one of the interminable Lord of the Rings films without feeling any discomfort. The cable is another sign the Status OB-1s aren’t designed for outdoor use. It’s 2m long, fairly thick and attached to both cups rather than one. Those after a pair of affordable headphones for late-night TV or movie watching could do worse. Like the Status CB-1s, they have a 3.5mm jack, but there’s a screw-in 6.3mm adapter included in the box too. It's with performance, though, that the OB-1s really betray themselves. There are issues with the sound that makes them a fair buy for the price, rather than a good one. They have a vacant-sounding, low-definition midrange that give vocals a hollow character. There’s some detail and texture in the upper-mids and treble, but certain parts of lower male vocals in particular end up somewhat characterless. These headphones sound big - but they lack agility and are rhythmically confused when playing anything challenging. Feed the Status OB-1 a busy track like Kamasi Washington’s Change of the Guard and they sound lost, dynamically flat. There’s not enough structure to the sound, and much of its make-up is lacking in detail. There are some positive elements to note: treble is non-sibilant (though a slight fibrous quality to its tone is another indication you’re not listening to a high-end product); bass weight is hefty for an open-back headphone too (though slightly slow decay and general softness add to the Status OB-1s air of confusion); the open design gives them a wide soundstage and spacious presentation. But the dynamic and rhythmic impotence is a significant issue, and one that can’t be fixed with EQ. While not without merit, headphones around the price from bigger names provide much punchier, more detailed and satisfying sound. A lot of open-back headphones are significantly more expensive than the Status OB-1, but the Grado SR80es (for example) are certainly worth the extra £20. The Status OB-1s look good enough and are well-made, extremely comfortable and much cheaper than most similar-looking open-backed headphones. The sound is wide, warm and has some open-back characteristics you want. But there are quite a number of sound issues. Their timing is poor, several key areas lack detail and the character in general is soft and unfocused. You can do better.